A member of the 222nd Anti-Tank Company of the 42nd Division snaps a photo while a convoy of trucks rolls through a small Bavarian town. 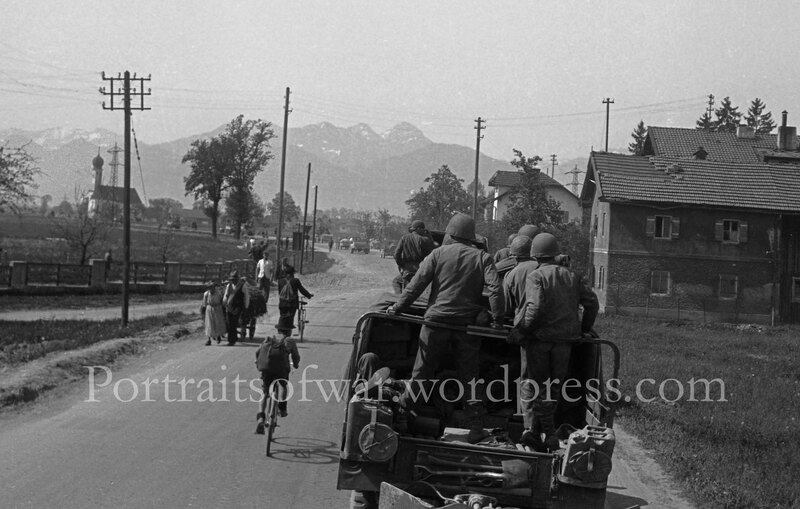 One of a series of nearly 800 negatives from the 222nd that I acquired last year; this photo encompasses the fast moving blitz through Germany and Bavaria that the 42nd took on during the last parts of the war. My father was a member of the 222nd. Louis J Hendricks jr. Does any one remember him? He is now 88 years of age. He was part of a 60 mm motor squad. I’ve sent text messages (yes, text messages) to a few of my 222nd veteran connections to see if anyone remembers your dad. Does he attend reunions? Which company was he in? Yes he did attend many reunions up till 2008. He is not able to attend anymore. He is just too weak and confined to a wheelchair. I do not know what company he was with. He did help liberate Dachau and fought in the Battle of the bulge. He was still there in Germany in 1946 as security. My father, Quentin Naumann, was in Company H of the 222nd. He led the mortar platoon but later briefly was company commander or executive officer. He passed in June 08. I am very interested in images that might pertain. And is there a way to view all the 800 images you have in succession? Thank you. I don’t have any specific shots of H Company. Have you tried contacting the 42nd Infantry Regiment veterans group? I attend a yearly get together with them and can ask around to see if anyone was in H company of the 222nd. I’ve spent a lot of time with members of the 222nd – they are a great bunch! My father was a member of the 42nd Division, 222nd infantry. He was given a battlefield promotion to captain of a company not too long before the left the region of the Battle of the Bulge and moved toward Munich. I never knew his company number, I only knew that he had trained anti-tank troops at Camp Gruber. Long before the internet I knew he eventually end up in Marienplatz, in Munich, where (much to my father’s surprise) the mayor “surrendered” to him and gave him as ranking officer in the square the knowledge that their was a POW camp south (?) of Munich. A few days before, his company had separated from the group that went to Dachau, including another living soldier and best friend of my father. My father is still alive and has just seen some of your pictures. My mother is also alive and went to Europe with my father during the army of occupation. As you can imagine, I might be interested in other photos from your collection. Excited to help! I have a lot of photos from the 222nd that I will share. My father servied in Co L, 2nd Battalion. Do you possibly have any photos that might include this unit? He joined the unit in late January ’45. I am researching a book that will contain biographies and photographs of the 96 men from Duplin County, NC, who died in WWII. One of these men is PFC Kenneth Allen Blanton, U. S. Army, S/N 44013751, who was a member of the 222nd Inf. Regt., 2nd Bn., Co. E. He was KIA near Dachau on April 29, 1945. I would greatly appreciate any information that anyone can provide on this soldier. I passed your question on to someone who may be able to help. I’m friendly with many guys from the 222nd but none from E Company. Update from April 2014.Richard Miller was in lead jeep outside Wertheim Germ. When fired upon by machine guns, grabbed machine gun off jeep an pinned down enemy until they could be destroyed.He was given Bronze Star 12 Sept. 1945 .Major Gen. HARRY Collins was commanding. He was in the 42nd. INF., DIV. 222nd. Inf. Co.D. Entered service from Aitkin , North Dakota. Looking for information on my grandfather. He served with the 42D Infantry Division A/T Company 222d. I have his leave card, application for rations when visiting a family in Camp Gruber. I know that he drove a truck to and from the frontlines. Looking for any information. His name was Willie B. Kesler Jr. from West Virginia. He passed away in 1986. My Great Uncle, Capt. Harold Bugno was in K Company. KIA and awarded the Silver Star posthumously. Looking for any information out there. Thanks!